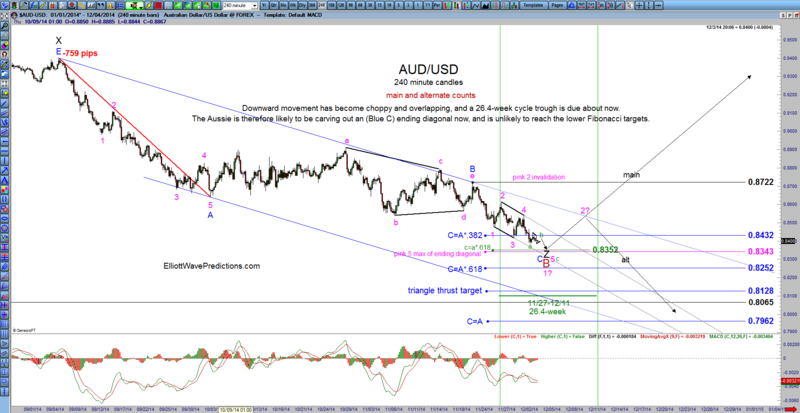 This entry was posted in Analysis Forex Analysis and tagged Elliott Wave Hurst Cycle Analysis Sentient Trader on December 4, 2014 by Sid Norris. Utilizing a Sentient Trader organic analysis of the AUD/USD currency pair starting at the December 1996 high, it appears that the Aussie is headed down into a large cluster of cycle troughs, the largest of which is at least of the 18-month variety. Inside that cluster of troughs, the 26.4 week cycle is expected now within the fairly narrow date range of November 27 through December 11. Further support of the idea that a major low is near is my Elliott Wave count below, which shows that the movement down from the July 2011 top is clearly corrective, and appears to be nearly finished with a complex WXYXZ correction. 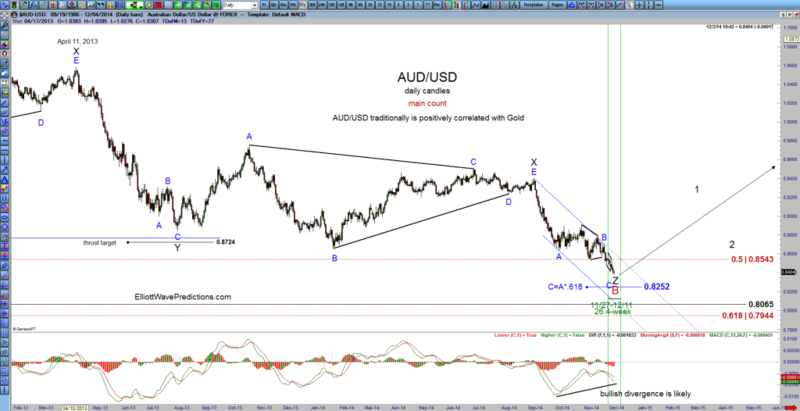 The daily chart shows a bit more detail . .
To conclude, based on the combination of Sentient Trader’s Hurst cycle analysis, and my own Elliott Wave count and associated Fibonacci price targets, I believe the Aussie is likely to bottom in the next couple of days at about .8352 as shown on the 240-minute chart below. Thank you Sid, I agree. This bottom is in other popular pairs too. There is reason to think they can stretch longer, but the 80 day FLD priojection should be satisifed quite quickly, when this does turn up. 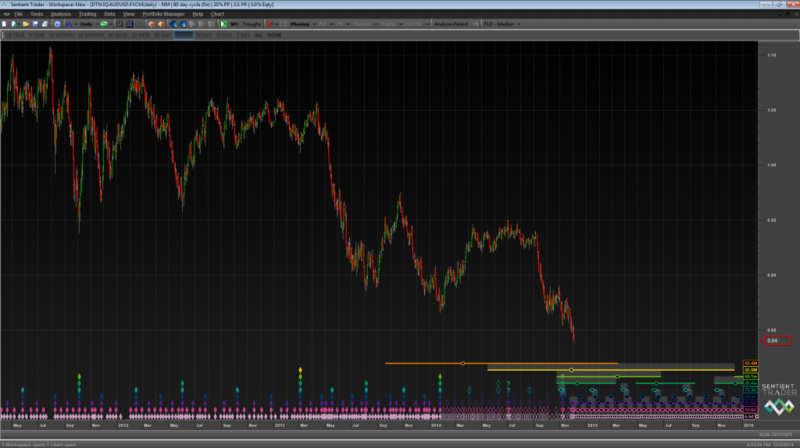 Ive been debating going for the 20 week projection where the peak of which should be the second 80 day cycle. If strong buyers come in Ill be confident to add to these forex trades long. Hi Sid. It is great to see Hurst Cycles and Elliott Waves together. Thanks for the post, I look forward to seeing many more! The more I use Sentient Trader, the more I am convinced that the combination of Hurst and Elliott is quite powerful. For instance, After 5-waves up (for a wave 1), an Elliott trader would generally look for a corrective .5 to .618 retracement (in the form a wave 2) to get long in anticipation of wave 3 to the upside. Elliott however does not include a methodology for predicting how long wave 2 will take to completion. Hurst/Sentient is a HUGE addition to the Elliott trading methodology, because it actually allows the trader to predict how long the wave 2 will take, therefore preventing getting in too early. 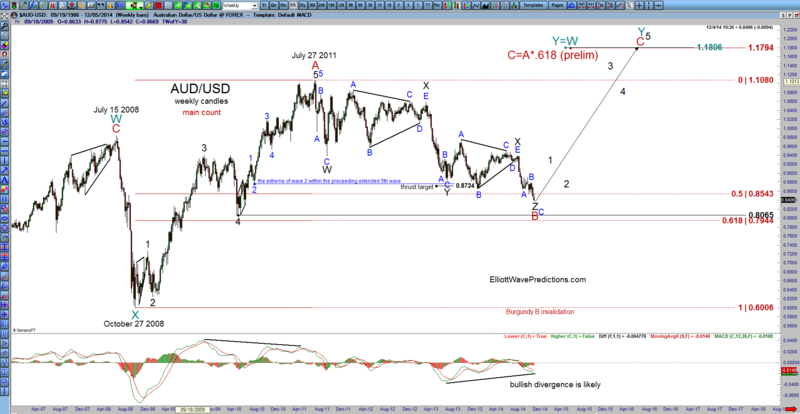 It can also prevent the Elliott trader from taking the trade at all, if it expects further lows in the near future. There are, of course, many other examples of how Hurst/Sentient can assist the Elliott Wave traders and vice versa. I’m quite exited about it! Thanks for developing the ST software David. It really is amazing. Thank you Sid. I’m always pleased to hear that ST is providing value. I have long thought that the combination of Hurst and Elliott Wave is very powerful. I will try to post some of my thoughts about this soon. 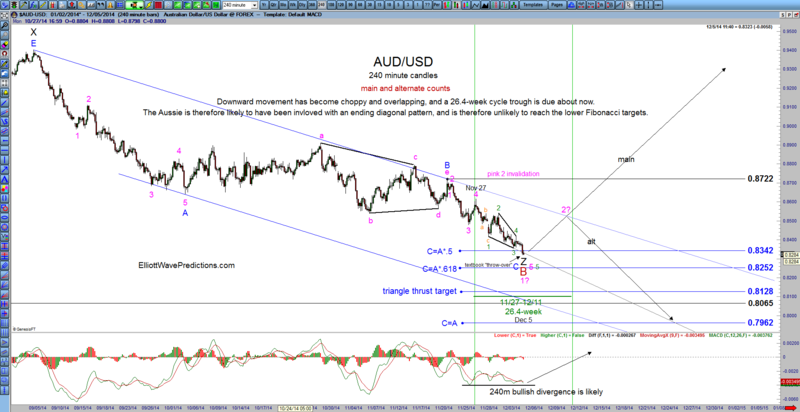 a quick update on the intraday AUD/USD count . .